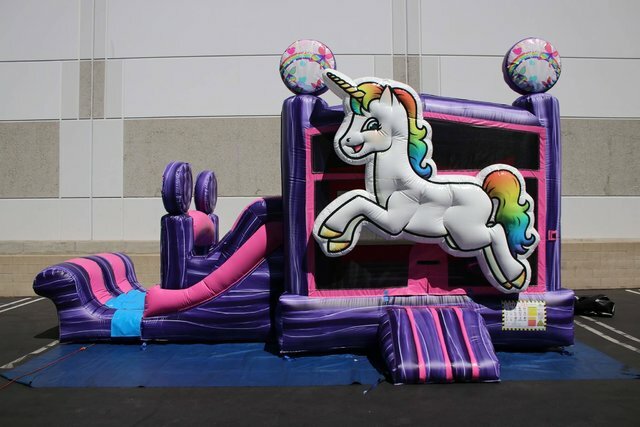 Unicorn Combo Bouncer Rentals | BounceGeeks.com Richmond, VA. The magical Unicorn is here and it's awesome! Unicorns are beloved by children all over the world. Bring this beautiful creature to your party and watch the kids light up with joy! Our brand new Unicorn combo bouncer is truly a sight to behold with amazing colors and huge 3-D unicorn. The slide can be used wet or dry, making it perfect for any party. We don't think this awesome unicorn will be available for long, so best reserve it now! This combo was rented in Moseley for a birthday party and the kids absolutely loved it! Features basketball hoop, climb and slide. Note: basketball is not included. If you want to use a ball, it MUST be something soft so no one gets hurt!